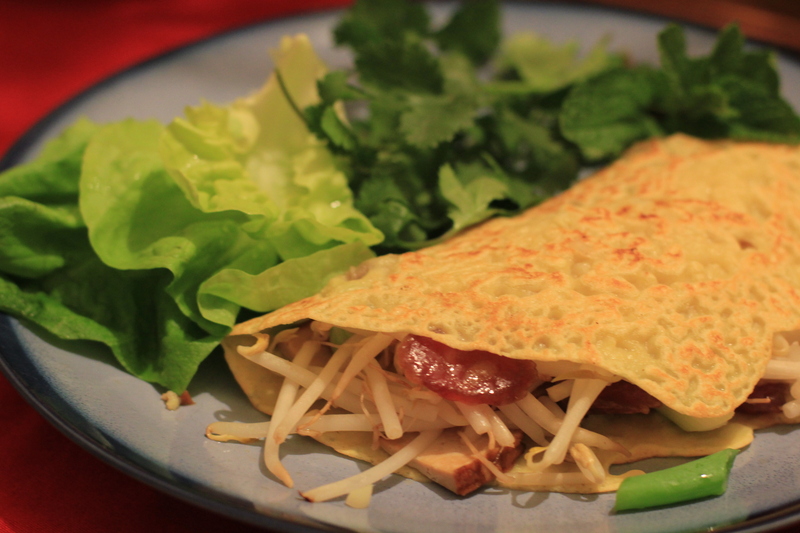 Vietnamese bánh xèo might be the quintessential eating out food: seemingly designed to be served to order in a restaurant environment, these stuffed rice crêpes are a little finicky to put together at home. You need to have all of your fillings and herbs washed and prepped in advance, and then the crêpes themselves must be eaten as soon as they are cooked. 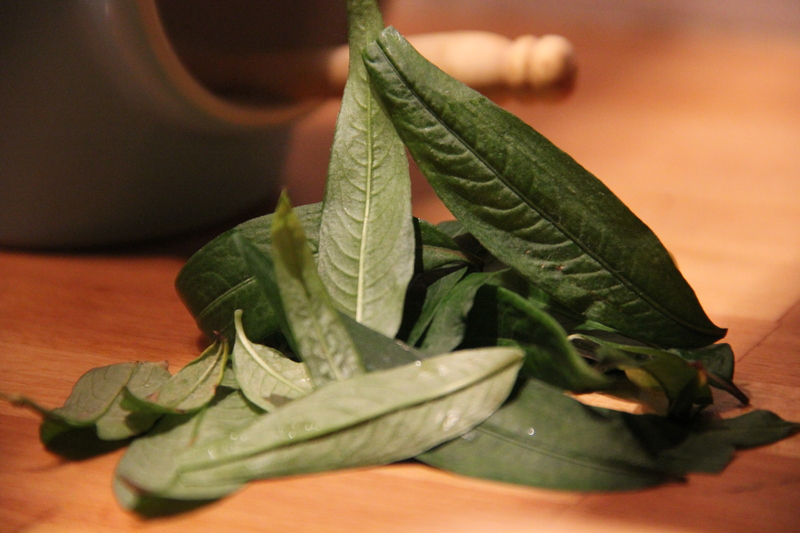 Bánh xèo are thus not ideally suited to relaxed home cooking, especially if the cook wants to eat with her guests. Undeterred by the one-crêpe-at-a-time serving problem, I’ve made bánh xèo a few times, sucked in by their addictive combination of fresh leaves and soft, chewy pancake. 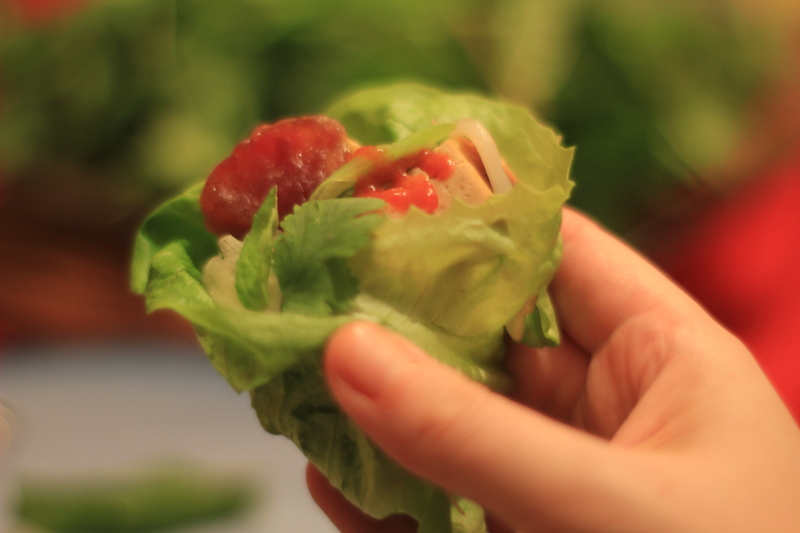 I’m also a big fan of Viet dishes that involve wrapping things in lettuce and dipping into sauce – something about the do-it-yourself quality appeals in its tactility. And bánh xèo are actually quite easy to make – pouring the batter into a perfect circle takes a bit of practice, but unlike French crêpes, you don’t have to flip them. So once you commit to having everything chopped in advance, making bánh xèo offers almost instant sizzling gratification. When I’ve eaten bánh xèo in restaurants, the filling has always been shrimp and pork, but I’ve read that in Vietnam there are many more variants. I’ll be able to research this important question later in the year when I go on my very exciting eating trip to Southeast Asia, but for now I have been experimenting with the wide world of Things One Could Put in Bánh Xèo. As is the way with such experiments, it has often been led by things I have in the fridge. This time, I hit on a combination of lop cheong and smoked tofu along with the traditional beansprouts and scallions. I should say that I’m a bit obsessed with lop cheong (or lap xuong in Vietnam). This air-dried and cured Asian sausage is sweet and almost winey tasting, and often very fatty. It provides some of the unique flavour in Chinese sticky rice wrapped in lotus leaf and it’s a great pantry staple. The first web page I ever made was about lop cheong: I was at a deathly dull class on web design and we were asked to make a mock up of a site for work. Most of my classmates seemed to have all their material ready to go but I was recently hired and didn’t have anything to use. 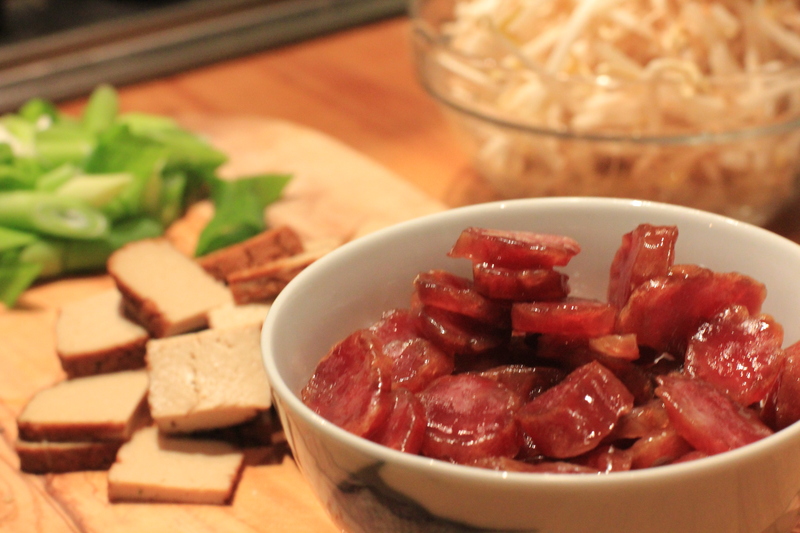 Naturally, I made a website about sausages, and a sample page on lop cheong. I think the class leader thought I was taking the mickey, but I did end up making friends with the woman sitting next to me, who turned out to be a fellow fan of the Chinese sausage. Anyway, the point is that it should come as no surprise that I came up with the idea of adding this air-dried sweet sausage to my Vietnamese crêpes. If you wanted to make this dish vegetarian, obviously just leave out the sausage and add more smoked tofu. It’s worth getting the smoked kind for both flavour and texture. 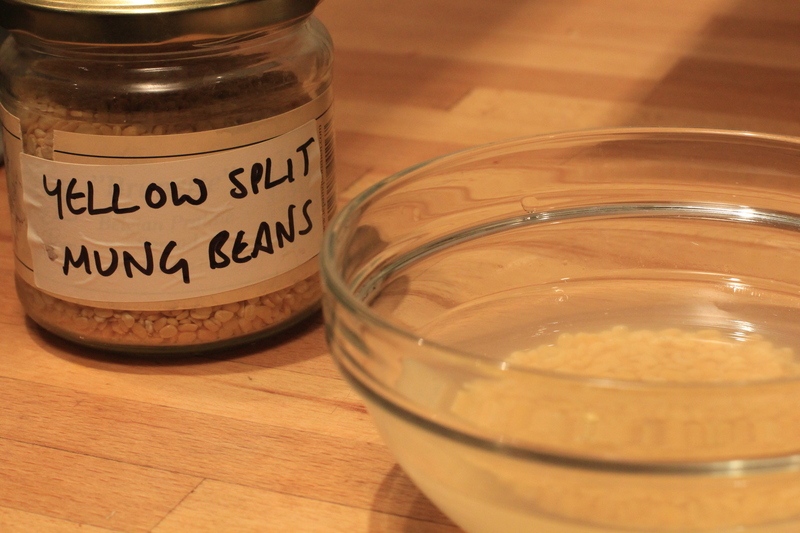 Firstly, you want to soak your mung beans. They only take a half hour and add a really nice nuttiness to the batter. This crêpe batter I learned from Jeffrey Alford and Naomi Duguid’s Hot Sour Salty Sweet, a splendid book on Southeast Asian food cultures. While you’re waiting for the mung beans to soften, make the nuoc cham dipping sauce. Begin by pounding a small garlic clove in a mortar and pestle along with a chili. (You might want to chop the chile finely first to make life easier.) Next, add the palm sugar and pound until it becomes liquidy. It looks like a lot of sugar but be generous: this amount is a minimum and you might well want more. Next add the fish sauce and a good glug of warm water. Stir to dissolve the sugar well. Now decant into a bowl and add the juice of a lime. Taste for flavour balance. You might find yourself adding more lime juice or more water. Set aside. Now make the pancake batter. Put drained mung beans and coconut milk into a mini prep or small blender and process till smooth. (Don’t do this in a big food processor as it won’t work and will look disgusting. Trust me on this.) Move to a larger blender and add the water, rice flour, salt, sugar and turmeric and process till smooth again. Now sieve the batter to get rid of lumps and let stand for a half hour. While you’re waiting, prepare the filling and toppings. Slice the lop cheong thinly and steam for 15 minutes. Chop the scallions and tofu. Wash the lettuce leaves, beansprouts and herbs. Put the greens on a plate for serving, and lay out the fillings close to the cooker. Now you’re ready to make the crêpes. Heat a wok or non-stick frying pan to high and wipe the surface with a paper towel soaked in oil. Pour in 1/3 cup of batter and as you pour, lift and angle the pan to make the batter run into a circle. Put it back on the heat and distribute sausage, tofu and beansprouts over half the surface. Cover, turn down the heat to medium and cook for 3 minutes. The underside of the crêpe should be browning and a bit crispy, the top side soft and bubbled. Lift the crêpe onto a plate and fold in half. Serve immediately as you cook them, for guests to wrap in lettuce and herbs. Serves 4 for a main course, more for appetisers. Recipe adapted from Hot Sour Salty Sweet. One of the hardest things in learning about Asian food from my white European perspective is getting to grips with the astonishing array of herbs and greens used in each cuisine. For one thing, many Asian herbs just aren’t available in the west, and at a certain point, substitutions leave you feeling you’ve lost the spirit of a dish. Even when Asian greenery is available, it’s hard to know what’s what. My favourite Hong Kong supermarket in New York had a pretty simple English-language labelling policy: everything that came from an animal was labelled “fish” and everything else was labelled “chicken”. Entertaining, to be sure, but not super helpful in distinguishing your kai lan from your pak choi. This combination of beautiful produce and language barrier taught me to shop differently, to pick what looked fresh and test out flavours at home. This was an important lesson in starting from first principles, being led by the ingredient, but I still wanted to learn the traditional combinations of the cuisines I enjoyed so much. How to bridge the gap between the ingredients described in books and those piled up in stores remained a challenge. I was hugely excited, then, to see an array of international herbs at the UK Fiery Foods Festival in Brighton this summer. Now, I am not a gardener, or I’d probably have thought of growing my own herbs before. Seriously, I do not have green fingers. I killed a cactus once. But coming upon a display of fresh lemongrass, Thai basil and Vietnamese coriander was too much temptation to resist and I went home with a giant bag of pot plants. I wasn’t exactly sure at the time what “Vietnamese coriander” was. The woman who sold it to me said it was extremely pungent and I should use only half a leaf at a time. This seemed kind of crazy, since its taste was somewhere between cilantro and lemon verbena. I couldn’t think of a good reason not to throw handfuls into my next spicy salad. When I got it home, I figured out that I had bought the herb called rau răm in Vietnam, pak pai in Thailand, and daun laksa in Malaysia. It’s an important Southeast Asian ingredient, essential for laksa, as its name suggests, and used in Laotian larb as well as Vietnamese salads, summer rolls and noodles. It also grows enthusiastically, despite my incompetence, so I’ve been testing it out in a range of dishes. It doesn’t quite work in Thai salads where you want the more forcefully perfumey top-notes of Thai basil, and it seems to fight with fruit. It does marry well with meats, though, especially beef, and it combines well with mint and cilantro. 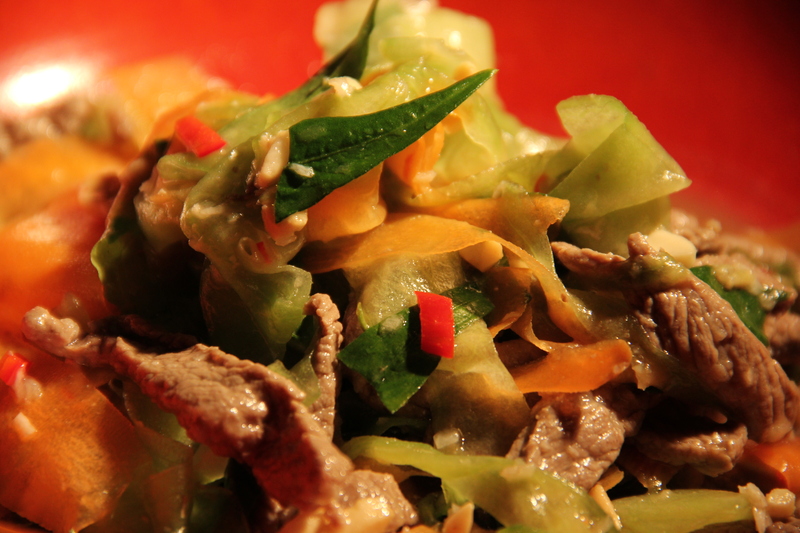 Given these affinities, I tried it out in a Vietnamese beef salad that would usually be made with sawtooth herb. 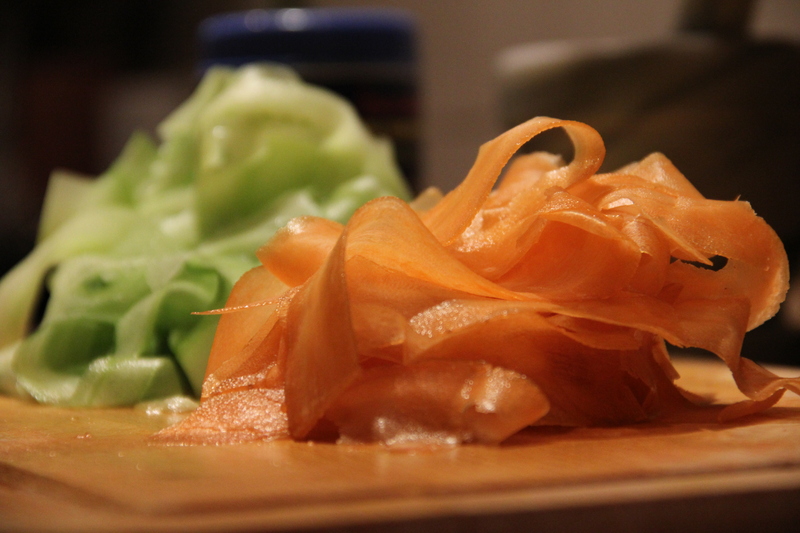 Peel the carrot and cucumber and then slice into very thin long strips with the peeler. Put them in a bowl and add a tablespoon of caster sugar. Mix well, leave for ten minutes, then drain and squeeze out the excess liquid. Make the dressing: pound one garlic clove and one chili in a mortar and pestle, then add palm sugar and pound till softened. Add lime juice, fish sauce, and taste for balance. You might need more of one thing or another. In a bowl, mix the meat with tamarind water. Add the vegetables, remaining chilies, sliced, and herbs. Dress, mix, and garnish with the peanuts. Serve with rice. 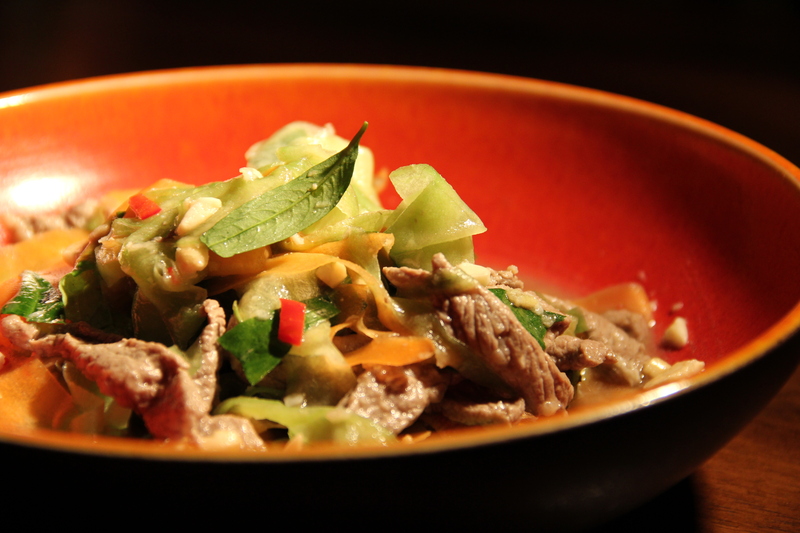 Recipe adapted from Luke Nguyen’s The Songs of Sapa: Stories and Recipes from Vietnam.